ROMEOVILLE, Ill. (WLS) -- A 33-year-old woman died after the car she was driving went into a retention pond in southwest suburban Romeoville. Police received a call about a vehicle in the water Lakeview Drive and Remington Boulevard just before 11:30 p.m. Monday. Investigators learned a gold 2002 Honda was traveling north on Lakeview Drive before it went through the stop sign at Remington, across a grassy parkway and into the pond. 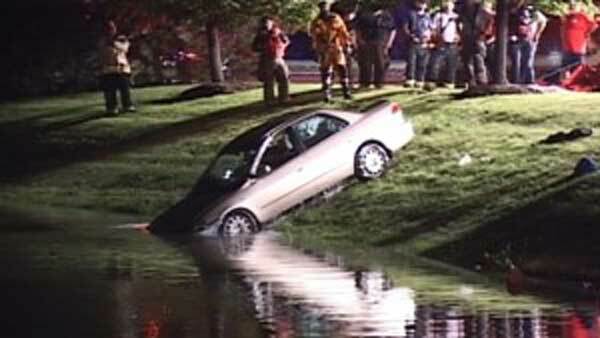 Divers pulled the driver from the submerged car. Crews recovered the vehicle from the water. No other occupants appeared to have been inside at the time of the crash. Police said identified the driver as Cynthia Breig, 33, of Bolingbrook.